First, there was Qana. Next, there is Srifa. (Irish Times via CounterPunch) The Total Destruction of Srifa: Mangled Bodies in the Wake of Israeli Bombs and Missiles. By Lisa Marlowe. August 2, 2006. It was an unseemly end for 80-year-old Manaheel Jabr, flung over a bloodstained walll, grey hair falling around her shrunken black face, a collapsed ceiling pinning her down at the waist. "It's the grandmother," one of the onlookers gasped when the civil defense bulldozer finally pierced a hole in the rubble of what was until two weeks ago a three-storey house. Mrs Jabr's corpse presented a terrible dilemma to the Lebanese Red Cross yesterday. Should they cut her in two, put the pieces in a body bag and take her to the hospital morgue, or leave her behind, in the hope that more powerful equipment could lift the concrete slab from her back and would reach her before the dogs did? 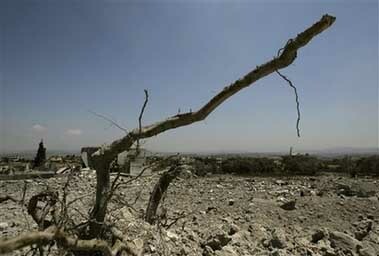 It was late afternoon and the 48-hour "pause" in aerial bombardment promised by Israel was drawing to a close. The Red Cross's plan to retrieve 89 bodies across the war zone was about to end in failure. The Israelis, with whom the Lebanese Red Cross communicates via the International Red Cross, granted safe passage to only two of the six villages that the rescue workers wanted to visit yesterday, Srifa and Bint Jbail. And the convoy bound for Bint Jbail had to turn around because of bombing. That left only Srifa, the site of the most dramatic devastation I have seen in this war. 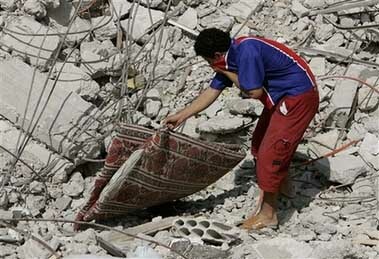 The entire Hay el-Birki neighbourhood - 18 buildings by some accounts - was flattened at 2 am on July 19. "The F-16s [ fighter bombers] came from the west, the Apaches [ attack helicopters from the east," said a local Hizbullah official who identified himself as Abu Hadi. It seemed amazing that bombs and missiles could chop buildings into so many million of grey concrete pieces, a bed of rubble many meters deep, with only the occasional slipper or coffee pot to remind one that human beings lived here. The field of ruins stretched to the horizon, reminding me of images of second World War bombings. 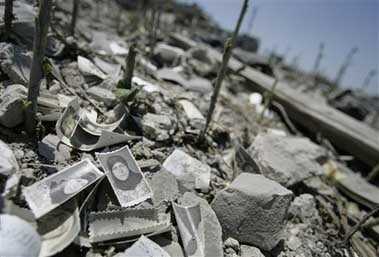 Thirty of the 89 names on the Red Cross list were in Srifa, eight in the house where we found Manaheel Jabr. Yet after battering away for four hours in the hot sun, the Red Cross and civil defense volunteers found only three corpses - one of them Mrs Jabr's - and a crushed skull. It took the Israel airforce minutes to flatten Hay el -Birki but it could be weeks or months before their victims are dug out. The technology used to destroy the neighbourhood was the most sophisticated in the world. The means to dig them out derisory. At about 1pm, a resting Caterpillar bulldozer clamoured down the main street of Srifa belching black smoke and chewing up the tarmac. The driver stopped to put a white sheet with a Red Cross emblem on the roof of the cabin, in the hope of sparing it from bombardment. For the past two days, Israeli forces have battled with Hizbullah at Taib and at Adayseh, just 19 kilometres from Srifa. All afternoon we heard explosions, some frighteningly close. "Israeli forces are trying to push in on the ground," explained Abu Hadi, the Hizbullah man. "Hizbullah is protecting Lebanon - mortars, RPGs and even suicide missions if necessary. We will not let them in. We are protecting the border of Lebanon." The bulldozer was joined with a digging machine with a scooped shovel. "Stop, stop!" an upset Hizbullah man with a walky-talky insisted as the bulldozer began pushing pieces of the former house down the hillside. "This is not the way to do it. You will crush the bodies. The Lebanese army has better machines. We must wait for them." The Red Cross moved briefly to another address where civilians were known to have died. A medic in an orange jumpsuit placed a mattress over two black shrunken legs which stuck out from heavy rubble in the bomb crater. "In Islam, we must respect a body," said the Hizbullah official objecting to the Red Cross operation. "Either we wait for the Lebanese army machines, or we wait until the war is over and do it ourselves, even if there are only bones left." 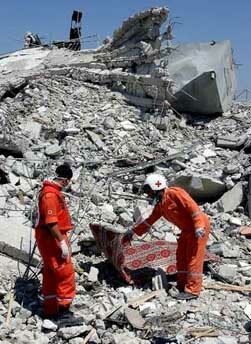 With infinite tact, the Red Cross persuaded Hizbullah to allow them to continue work on the Jabr house. The gruesome task had been easier on Monday, the first day of the mythical truce, when volunteers collected 20 bodies from cars and the streets of seven villages. 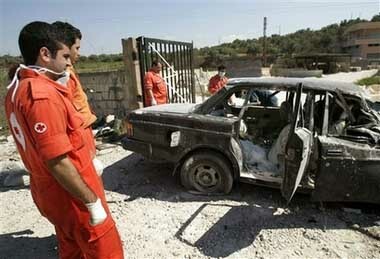 "Some are only bones and some are teeming with maggots", said Muhammad Makke head of the Red Cross in southern Lebanon. "Some of their identities are known and some are not." Red Cross volunteer Kassem Shalaan (28) lost 60 per cent of hearing in one ear when the Israelis fired on ambulances in Qana on July 25th. A man in the ambulance had a leg amputated by the missile, and his seven-year-old son, who had already suffered shrapnel wounds, is still in a coma, after the missile strike slashed his head open. Shalaan took part in the body retrieval missions of the past few days. Is it true that dogs are eating corpses? "Yes," Shalaan said, turning his head to hide the tears. "Especially people in the streets and cars. The ones who are buried alive are usually safe from the dogs." Whatever the outcome of this war, atrocities such as Srifa will poison Lebanese-Israeli relations for decades or even centuries. Mahmoud Jabr (56) lost six relatives in the bombing of Srifa; among them his brother who owned the house that was partially excavated yesterday. "There is not even a bullet in this village," Jabr said. "Israel forced the people to be Hizbullah with their barbaric behavior." 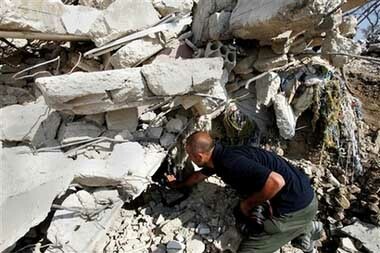 Mahmoud Nejbi ( 66) keeps returning to the rubble of another house, at the far end of the devastated neighbourhood. 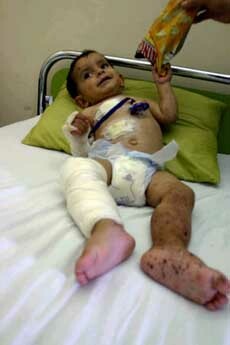 "My 27-year-old son was smoking the narguileh and drinking tea with his friends when the airstrike happened," he said. "He was a mechanic in Dubai and he brought his wife home to have their baby . . . I would like to make a suicide attack on the Israelis . 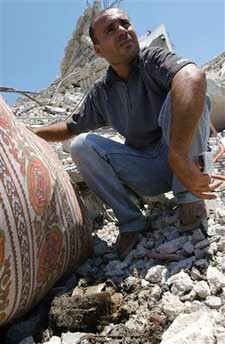 . . either the Israelis kill us or we kill them." 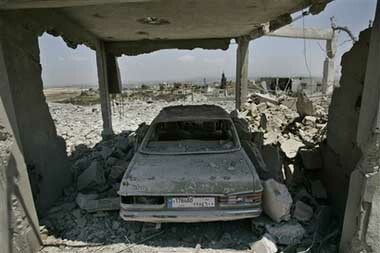 destroyed them, in the southern village of Srifa, Lebanon. Three square blocks of Hayal Jumma neighborhood of Srifa have been levelled.